In my view, billiards is one sport where age does not matter in order for one to excel. 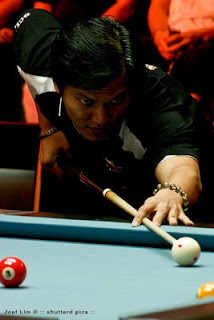 As a matter of fact, several former winners of the prestigious World 9-Ball Pool Championship, like Americans Earl Strickland and Johnny Archer, Chinese Taipei’s Chao Fong-pan, Germany’s Ralf Souquet and local idols Efren “Bata” Reyes, Alex Pagulayan and Ronnie Alcano, may be considered old for an athlete, yet they are good for some more years. While it is true that there are other sports such as chess and marathon where age does not also matter, it is on record that a Filipino is yet to become a world champion in these sports. In billiards, the Philippines has already produced three world champions. Hall of Famer Reyes was already 45 when he captured the world crown in Cardiff, Wales, in 1999. He is now 54. Supported by brothers former Assemblyman Jose “Popit” Puyat and Aristeo “Putch” Puyat, the toothless “Magician” is an original member of the powerhouse Puyat Sports stable that includes the 58-year-old Jose “Amang” Parica, Francisco “Django” Bustamante, 44; and 50-year-old Rodolfo “Boy Samson” Luat, who topped the recent Sen. Manny Villar Cup in Bacolod City. Pagulayan, the 2004 world champion and 2005 US Open winner, is the latest addition to the team. On the other hand, double world champion Alcano, who bagged the 2006 world 9-ball crown and the 2007 world 8-ball title, is now 35. Pagulayan, who won the 2004 world 9-ball and 2005 US Open crowns, is pushing 29. Veteran internationalist Strickland is now 47, but still going strong. He won the world 9-ball title three times, in 1990, 1991 and 2002. Archer, 40, captured the championships twice, in 1992 and 1997. On the other hand, two-time champion Chao, a contemporary of Reyes, took the crown in 1993 and 2000, while Souquet won it in 1996. Both are nearing 60, yet they are still capable of punishing young talents with their arsenals of flawless breaks, silk-smooth runs and merciless safeties. K.F. Cues (Kao Fa Cues) has been a supporter of the billiard industry for many years now and as of late, a more recent sponsor to two of the top professional players in the United States, Ga Young Kim and Tony Crosby. The cue maker/manufacturer has decided to take that sponsorship one step further in the way of teaming up with Tony Crosby as lead sponsor of his upcoming tour – the KF Cues 9-Ball Tour. K.F. Cues defines themselves as the leading professional in delivering exquisite pool cues and accessories. The company provides customers with not just sheer comfort, but stability and precision, along with excellent customer service. With forty years of cue making experience, K.F. Cues has extensive knowledge and offers absolute professionalism in what pool players need. As if the company being one of only a few ICA certified cue manufacturers was not enough of a credential to boast, support continues to grow via the professional pool scene with names such as Fong-Pang Chao, Tony Crosby, Ga Young Kim, and Xiao-Ting Pan proving its reputation in the billiards industry. Crosby, along with K.F. Cues, will kick off their first season together this September 27th-28th at TJ’s Billiards in New Port Richey, Florida, with its $1600 total added events. The tour will offer $1000 added open nine-ball events on Saturday and Sunday; and $600 added amateur events Sunday only. Entries will vary for the two divisions: the main event will run $65 which includes a $10 green fee and $10 registration fee; while the amateur field will be $50 with the same green fee/registration fee included. Juniors will play for $15, amateur ladies receive half-off entries, plus a discount will be received by those that play both divisions. Prizes will be provided to top juniors and top women players, along with Player of the Year honors. Chinese Taipei's Fong Pang-Chao, two-time winner of the World Pool Championship (WPC), got booted out Thursday night by relative newcomer Roberto Gomez of the Philippines, in an emphatic 10-2 match in 2007 edition of the tournament. 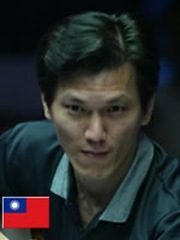 Fong was the 1993 and 2000 WPC titleholder. Gomez won this year's Norway Cup and Manny Pacquiao Cup, but this is only his second time to join the WPC. Last year, he got as far as the last-64 stage. This year he has advanced to the last-16 stage. Gomez, a native of Zamboanga City, will next face Niels Feijen of The Netherlands, who had earlier dispatched of Ralf Souquet, the 1996 WPC champ. Known as: "The Jump Shooter"
Chao Fong-pang is a Taiwanese professional pool player from Kaohsiung. He is a two-time WPA World Nine-ball Champion winning the tournament in both 1993, after defeating Thomas Hasch of Germany and again in 2000 when he beat Ismael Paez of Mexico. He has also won the International Challenge of Champions three times by besting Okumura Takeshi in 1995, Francisco Bustamante in 2001 and Thomas Engert in 2005. Chao Fong-pang is renowned for his jump shots, relying on them considerably more frequently that most other pros. One notable instance was when he played versus Francisco Bustamante at the 2001 ICC tie-breaker: Bustamante had made a good snooker behind a ball, leaving Chao in a difficult position. But Chao went for the jump, and made it to win the match and the title. While a majority of Taiwanese players play with open bridge hands, Chao is among the few who play with a closed or loop bridge. During the 2006 WPA Championship, he survived the group stages and the round of 64, but was eliminated in the round of 32 by Fu Che-wei. Chao Fong-pang was born September 15, 1967 in Kaohsiung, Taiwan and he is a Taiwanese professional pool player. He won the WPA World Nine-ball Championship in 1993 against Thomas Hasch of Germany. Thus, he became the first Asian to win a world title in pocket billiards. 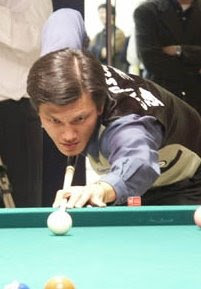 In 1995, he won the International Challenge of Champions against Japan's Takeshi Okumura, a player who won the world nine-ball the year after he did. Three year later, he won the gold medal in the eight-ball event of the Asian Games. 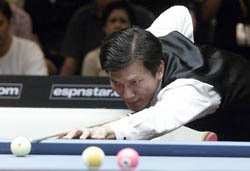 Chao regained the world nine-ball championship in 2000 by defeating Mexico's Ismael Paez, 17-6. The lead of that score was the largest deficit ever made in a world championship final. By 2001, Chao won for the International Challenge of Champions for the second time, defeating Francisco Bustamante who won the event back in 1999. He won it again for the third time in 2005 with a victory over Thomas Engert, the 2004 winner. Kaohsiung, TAIWAN : In a mighty clash between two of Taiwan's favourite pool players, the protégé Yang Ching-Shun prevailed over his long-time mentor Chao Fong-Pang 11-6 at the final of the Guinness 9-Ball Tour Kaohsiung tournament at the jam-packed Kaohsiung Business Exhibition Center. Of the six players Taiwan fielded for this leg, only Yang and Chao are native to Kaohsiung, and it was appropriate that the two should fight out for the US$15,000 winner's purse, after recording semi-final wins over Wu Yu-Lun (TWN) and Ronnie Alcano (PHI) respectively. Earlier, Yang had given three-time World Junior Champion Wu a lesson in composure, with Wu thrice scratching off his power break. From 2-7 behind, Wu managed to close the gap to 5-7 before Yang took another rack. Wu then won two more racks and had a golden chance to level the scores in Rack 16. Breaking first, Wu committed a mistake on the 1-ball, allowing Yang to clean up. Yang went on to take two of the next three racks to complete the win. "Speaking after the semi-final win, Yang said: "I'm feeling good and I'm able to read the table well. Wu's power break was spectacular but he often found himself out of position, or scratching, which handed me the initiative. I'd prefer to meet Chao in the final as there won't be much pressure to win – between us, winning and losing is an everyday thing." And Chao duly delivered after defeating Alcano 11-6 in the battle of two World Champions. It was Alcano who started the hotter, opening up with a solid 3-1 lead, highlighted by a magnificent 3-ball corner pocket off a two rail kick in Rack 3. But spurred on by his hometown fans, Chao turned the tide to win six straight racks, including capitalising on Alcano's mental lapses in Racks 6 and 8. Alcano then shifted to a soft-break, taking three of the next four racks before Chao surged again. From 8-6, Chao took the next two racks to break Alcano's spirit. Needing to win Rack 17 to stay in the match, Alcano was presented with a golden opportunity with an easy 3-9 combo. Alcano proceeded to fluff the shot, allowing Chao to complete a popular win. Commented Alcano: "It's ok. Chao really was the better man today. His break was going for him all through out the match. Plus he ate up the difficult positional plays I gave him. Even after using my soft-break I knew it was going to be very hard to come away with the win so I guess it's alright. I'm still proud of myself." Having been knocked out by Alcano in the Group Stage in Jakarta, Yang was out for redemption in Kaohsiung. A three-time winner on the Asian 9-Ball Tour, including the very first tournament in Singapore back in 2003, Yang was a mirror of calmness as he jumped to a 2-0 lead. Opening the match up with a runout, he cleaned up Rack 2 after Chao came up dry in the second rack. Chao levelled at 2-2 and then 3-3 before Yang went on a four-rack run to lead 7-3. Chao then won Rack 11 on the three-consecutive-foul rule, a rare occurrence in the game of pool. Off the break, Yang messed up an easy pot on the 3-Ball to snooker himself. Unable to get a shot on the 4-Ball, Yang committed a deliberate foul by hitting the 6-Ball close to the 4-Ball to prevent Chao from getting a shot with ball in hand. The ploy backfired as Chao was able to set of a safety that Yang was unable to get out of. Chao then repeated the dose to force the third foul from Yang that cost him an automatic rack forfeit. Despite taking three of the next four racks to close to 6-8, Chao was helpless as Yang surged again, taking the next three racks to complete a deserved victory. Said Yang after the victory: "I feel great. I knew my form had not been good lately, so I made sure I prepared well in the two weeks leading up to this event. I have made sacrifices and this is the fruit of my labour. It's not always that you get rewarded for what you put in, so I am delighted." The Guinness 9-Ball Tour moves next to Malaysia with the tournament to be held from June 15-17 at Genting Highlands. In July, the Tour goes to Singapore before going to Shanghai in August. The Guinness 9-Ball Tour Grand Finals will be held in Bali from August 31 to September 2, offering a winner's purse of US$36,000, one of the biggest in world pool competitions. With total prize money of US$350,000, the 2005 Kaohsiung World Pool Championships caught the attention of pool experts from all over the world. From the 2nd to the 10th of July, 128 pool experts from all over the world contended for the title of World Champion, and after a gruelling competition, the champion rewarded himself with a stay in Taiwan. The champion was a 16 year old boy by the name of Chia- Ching Wu, who has also made history by being the youngest World champion ever. This is the first time ever that the World Pool Championships has been held in Kaohsiung and was a huge success given the number of high profile players that it attracted. Amongst these pool experts were the 1993 and 2000 World Champions, Fong-Pang Chao and Ching-Shun Yang respectively, as well as the 2004 runner up, Pei-Wei Chang, of which all are local athletes. Besides the local athletes, many other top athletes competed, including last year's World Champion from Canada, Alex Pagulayan, the 2003 World Champion from Germany, Thorsten Hohmann, the current top ranking player, Ralf Souquet, the only player to win the World Championships three times, American Earl Strickland, the champion from 1999, Filipino Efran Reyes, the king of pool, Franciscio Bustamante, and the 2001 World Champion, Mike Immonen from Finland. In the opening ceremony, the Acting Mayor of Kaohsiung, Chan Chi Mai said that due to the fact that there are many pool experts based in Kaohsiung striving day after day to raise the competitive standard of the game, Taiwan has earned the title of the "Pool Kingdom", which makes the tournament in Kaohsiung all the more meaningful. The 2005 Kaohsiung World Pool Championships were put together by the collective efforts of the Kaohsiung City Government, ESPN STAR Sports, Matchroom Sports, the National Council on Physical Fitness and Sports, and the Chinese Taipei Billiards Association. Ten of Taiwanese most renowned pool experts including, Po- Cheng Kuo, Fong- Pang Chao, Ying- Chieh Chen, Jung- Ling Chang, Hua- Fong Wang, Chia- Ching Wu, Chun- Chiang Liu, Hui- Kai Hsia, Kun- Chang Huang, and Chien- Che Huang all made it to the final 32. Another player that deserves a mention is Kaohsiung athlete, Ching-Shun Yang, who lost to English athlete, Raj Hundal in the final 64. On the 10th of July, the final day of competition, Chia- Ching Wu completed the "impossible" by beating another Taiwanese athlete, Po- Cheng Kuo, with a score of 12:6 to 17:16 to be crowned the champion of the 2005 Kaohsiung World Pool Championships. At just 16 years old, Chia- Ching Wu became the youngest World Champion in pool history. After the game, Chia- Ching Wu raised both his arms up into the air with excitement and collected his prize of US$75,000. Finally, the champion hugged his grandmother tightly, and said with tears, "this championship win is dedicated to my grandmother who has always been there to support and encourage me".